Spring is the time of the young, the time of newborn things rising from the old and brittle: the young sprig, the tender shoot, the supple leaf. This is the song of spring. The summer is for strengthening. It is a feast all around, when the sun is at its highest. That which will endure and protect is forged in the summer. This is the time of bark and branch growing ever skyward, of things maturing but not yet mature. The fall is a time of fruits and seeds, a time of giving for the next generation. It is a time of plenty, a time of harvest, a time of storing up for the hard winter. And when winter does come, all life retreats back into the earth. Winter is the time of roots, the time when the great Mother prepares her bed for the coming year, and protects, and nurses, all of the young things that wait for spring to tenderly arise. It is a time of growing in deeper and dreaming in the darkness. Dreaming of the year to come. Each season prepares the way for the other, and they follow one after another in a glorious round. Ring upon ring upon ring. All the seasons of the great year cycle have their vitures, but the one which I want to talk to you about is the rooting virtue of Winter, for it holds a unique opportunity for replenishing that which has been diminished by our society. Unless we want our forests to go the way of the dodo (or the cedars of Lebanon, as it were), the firm roots of strong trees need to be bountiful, to hold in the soil, and create a solid ground on which we may stand and prosper for many cycles to come. The Standing People, the trees, have been sorely put upon all over this fair earth, and they need our help just as much as we need theirs. On that note, let us remember that we usually count the rings of a tree only after it has fallen, ripped into by that maniacle device known as the dreaded chainsaw (and the birds, insects, and animals scatter!). Ring after ring after ring, year after year after year of hardfound, laborous growth fallen in a blink, a breath, a heartbeat. “RUN, RUN, RUUUN!” the chainsaw growls (and the coyote howls!). I don’t see nearly enough trees these days, and even then not nearly enough of the most charished and rare kind. Apple, hazlenut, fig, yew, bay lorel, plum, elderberry… Even the forests left standing are managed by the government like a vast timber reserve, with no thought of the gleaners (animal and human alike!) who rely on wild nuts and wild berries, and the manyfold herbs of the forest to heal themselves. Even further from their minds is how these might feed and shelter us or our grandchildren in the coming years, when the tower of industry crumbles! Furthermore, trees are the crucial folcrum for a permaculture habitat, which, if these complex self-sustaining gardens become widespread, could feed us all with little effort and much benefit. It is in a small way an attempt to bring back Eden. Perhaps only knocking on the garden’s door, but that is a start. So I have been planting trees. My favorite trees. There are many different ways to go about this. You may stoke the soil with compost, or start your little tree-offspring in pots and plant them after they have grown roots. Do some research, adapt to your situation, and set your mind on sweet victory! In the fall or winter, as life turns back to the earth for rest and roots are stretching into the soil and rains are coming down, take a branch from an old tree of your choice. Take a few. Take many. Offer thanks, and tobacco, if you feel you should (which you should). 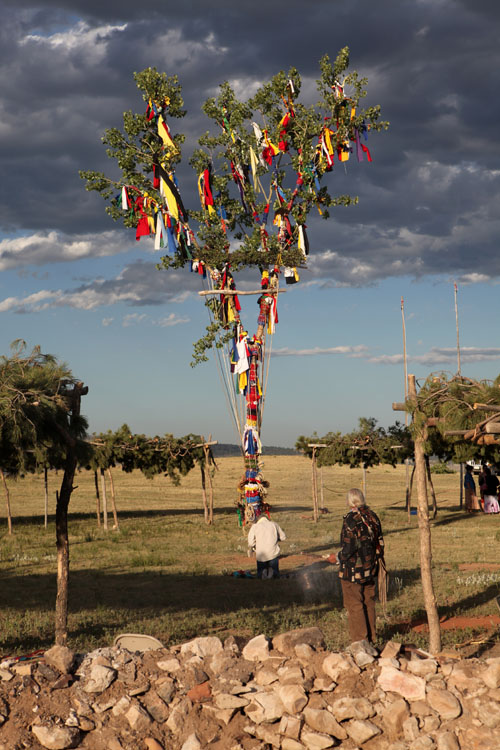 Tell the tree what you plan to do, that you are looking after the next generations and that you are doing this because you love the spirit of that tree. If that’s too loopy for you, at least feel some gratitude in your heart, and that should be enough. The branches should snap off easily at their base. They shouldn’t be too big–at most branches with two or three twigs growing out–but not too small either. They should be at least a foot or so long, but longer or shorter is up to you. You can use single twigs as well, or bigger branches. Use wild varieties that are already adapted to your bioregion if you can. Remove all the leaves from your branches and soak them in willow water for a day or two (explained below). Then, find a habitat that you think the trees will thrive in, or a place that you would enjoy these trees growing (such as your garden, a forgotten lot, or your favorite trail), with plenty of space and enough light, and plant them using a stick to get their bases at least four to six inches beneath the soil. Be sure there are no air pockets around the burried part, because this will cause decay. Be sure that where you plant them will not be disturbed (ie: trampled or weed-wacked), so that the sacrafice of the partent tree (and your hard work) will not be thwarted. Plants are tough, though, and you might be surprised at what they can endure. Hopefully rain will be coming frequently (or at least eventually). It’s best to let the rains do the watering, as it is more holistic for the cuttings and they seem to respond better to it, but supplementing rains with willow water is beneficial I hear, and if it is the right time of year and no rains are forthcoming, this might be your only option. You will have to wait some time–perhaps three weeks–for them to root in thoroughly, so be patient! You will know you were successful when a gentle tug does not yield the twig. I first tried this experiment in the summer, and I was disappointed to find that my cuttings were not rooting. But then, after some winter rains and cool weather, I decided to check back on my efforts and viola! They were snug as a bug in their new homes. It is important to do this during late fall or winter, as any other time the twig will follow its instincts to grow upward rather than root downward. The tides of the seasons are flowing towards the sky in the warmer months, as the sun warms the waters and draws them upwards through sap and leaf and air. In the winter, all flows down, and down is where roots go, and roots are what you want. Every tree I’ve tried has responded to this treatment. The branches you pick (or snap off, as it were) will carry on their characteristics (such as an abundance of fruit, nuts, or leaves for shade), so choose wisely. I suggest you plant hundreds of trees, as I can’t imagine, at the Pearly Gates or the Halls of your Ancestors or the Ghost Road hereafter, anyone or anything on Heaven or Earth or anywhere between having a gripe with you planting trees. Hardy nut trees (besides oak) I find extremely wanting. It will take many years–perhaps 10 or 20–for these trees to start producing anything substantial, but there’s no hurrying a tree! And in the meantime other measures can be taken to prepare a permaculture paradise, such as the planting of shrubs, tubers and such. The edges of creeks, rivers, and drainages are especially welcoming, as water is nearby, the soil is well drained, and the animals will benefit from your efforts as well. In order to make willow water rooting solution, simply collect willow twigs of any of the willow species. Either boil them for five to ten minutes or simply let them soak for a few days (until the water obtains some color), preferably in the sun. I am also endebted to a young man named Will for turning me on to willow rooting solutions in the first place. Thanks Will! And, of course, willows may be propagated in this way as well, without a redundant willow water treatment. Willows have great medicinal and utilitarian value. I even hear rumors that they are especially effective at tearing up concrete and even disturbing underground infrastructure, as their roots will seek deeply and intuitively for water. Food for thought! I have meant to do an article on good old Johnny Appleseed for a while now, but haven’t had the chance. Now seems like a good one. He might be more of a good figure than you guessed. 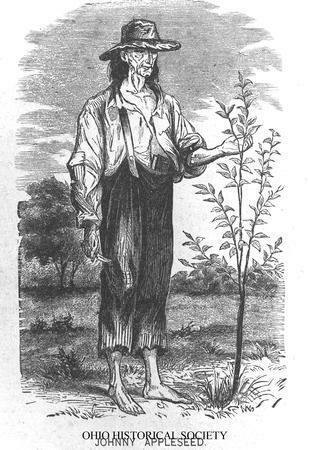 Johnny Appleseed was born as John Chapman in Massachusetts in the September of 1774, around the time when apples are ripening on the trees. In his teens he headed west, and lived a nomadic lifestyle with his brother Nathaniel. He was recorded to have planted apple seeds along a waterway while living in the Allegheny Mountains, which grew up and bore fruit. His father caught up with the boys in Ohio in 1805, and they joined together in the nursery business. He got his apple seeds by digging through the waste of cider mills, considering them too precious to be wasted. Thus, he may be one of America’s first and greatest dumpster divers. It should be noted that apples grown from seed are seldom sweet, and cuttings of prime apple trees are the best way to yield scrumptious fruits (ahem). But there was a great demand for cider in those days, and his business was in nurseries, whose trees were sold on shares. However, Johnny was known to never press debts from anyone, and cared little for profits. He was known to give away apple trees to those in need, and even gave away a lame horse whom he had nursed back to health, on the condition that it be treated humanely. He often went around in tatter-batter clothes of burlap or run-down hand-me-downs, and always barefooted, even in the snow. “For years, he traveled alone in the wilderness, without a gun or knife. He slept in the open air and did not wear shoes on his feet… He was famous for his gentleness and bravery. Both settlers and native Americans liked him. Everywhere he traveled, he was welcomed. 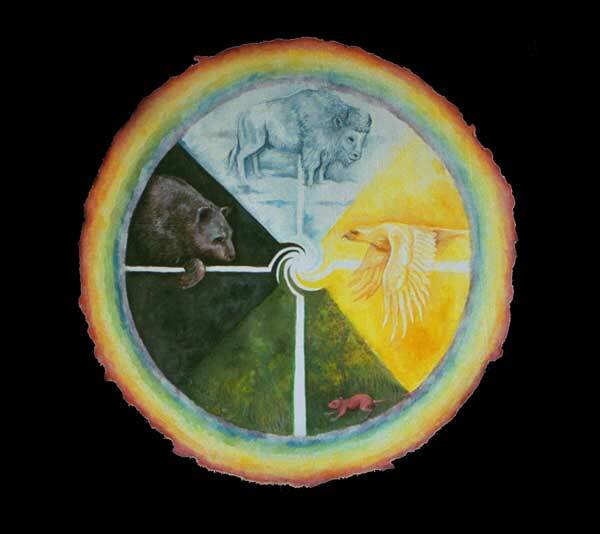 Reports from that period suggest that some native Americans believed he was ‘touched by God.’ Others called him a great medicine man.” (George Grow) He was always loved by children for his gentleness, and he never harmed an animal, believing that all humans need grows from the soil. Johnny was a missionary of the Swedenborgian faith, a Christian denomination based on the theories of Emanuel Swedenborg, of whom I find much interest. Swedeonborg was a psychologist by trade, who after having stunning visions of his own decided that his patients’ hallucinations of angels and demons may have in fact been genuine, and in a way more real than our everyday experience. He believed that the imaginal realm is the root of reality. So he treated his patients as if these characters were of real substance, if astral. But I digress. Johnny died of pneumonia at the ripe old age of 80-something. He looked not a day over 60, despite spending most of his life outdoors and nearly naked, clothed at most in tatters. A Texas congressman gave a speech after his legacy, for which we should not think less of old Johnny Appleseed. After all, he was underground by that time. I hope someone planted an apple tree where he is laid to rest, so that he was not underground for long. This entry was tagged anarcho primitivism, anarchy, clippings, cloning, cuttings, edible forest gardening, guerrilla gardening, john chapman, johnny appleseed, permaculture, primitive, seasons, swedenborg, trees, willow rooting solution. Bookmark the permalink.